Tag Archives for " virtual workforce "
At Duct Tape Marketing, we only have two team members that work out of the home office in Kansas City. In fact, they actually work out of a co-working space. The majority of our staff (including me) are virtual and spread out throughout the United States. On top of the Duct Tape staff, we also have a network of 100+ marketing consultants spread around the world and the majority of our clients over the years have been virtual. This provides a lot of freedom for the team and benefit for the company. However, it also has it’s challenges at times. Working on projects while never in the same room, building relationships with clients and training new consultants are all done behind the computer screen. The good news is – the vast amount of virtual tools available today has almost made this virtual arrangement easy. Asana is one of my favorite virtual tools we use; it is pulled up on my browser 24/7, and the app is downloaded to my phone. Something is so fulfilling with tasks disappearing off a checklist. 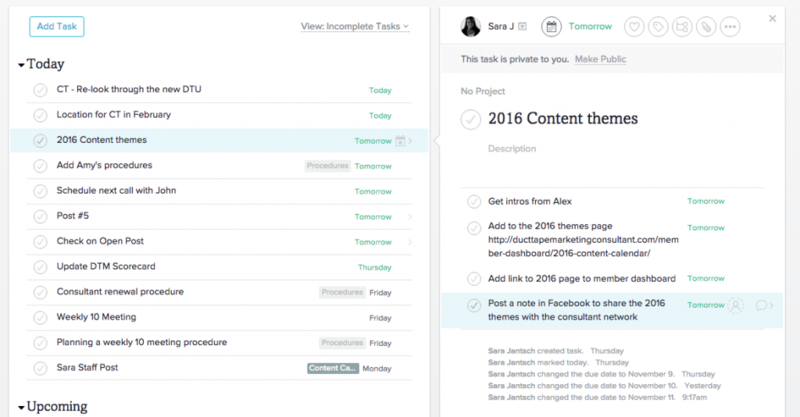 Asana’s tagline reads “The easiest way for teams to track work, and get results. Do great things together” and that is exactly what the app brings to my team. We have several projects in Asana for clients, content production, and various projects we have going on. If tasks are assigned to me, they will show up in my personal task list. I can then organize my task list into projects or due dates. For each task, you then have the option to have it recurring, add subtasks and assign to different members and add attachments from Google Drive or Dropbox. Located in Denver and managing virtual staff, this helps me understand exactly what team members are working on, eliminates email from our inboxes and keeps everyone focused. Here are some other great options worth checking out: Wrike and Trello. Hipchat is another virtual tool that is turned on 24/7 and downloaded to my phone. Hipchat is instant messaging, private group chat and video conferencing all in one. Some of my favorite features include group rooms versus individual rooms, status messages, so I can tell when team members are online and available, quick video/audio/screen sharing calls, and the ability to search or pull out links and documents shared. It is a great tool to get a quick response or start a team discussion. For the Duct Tape Marketing Consultant Network and also the Duct Tape Marketing System course, we use Facebook groups for communication with members. After testing tools over the years, we found Facebook receives the most response for bigger groups due to the habit of people regularly logging into Facebook for other personal or business reasons. The community groups are an effective way to build community, encourage networking and sharing tools/advice over the years. I use GoToMeeting on a daily basis as one of my roles at Duct Tape is to speak with anyone considering joining our network. These calls are typically screen sharing calls where I am conducting a demo. GoToMeeting is easy to use, includes HD video, screen sharing and allows up to 25 people to join the call. The recording feature is also great to capture important conversations with the click of a button. A few GoToMeeting competitors include WebEx, join.me, and AnyMeeting. Harvest is a simple time tracking software. Time tracking sounds like one of the most unexciting things I have heard of in awhile. When we decided to bring on Harvest, I am not going to lie, I dragged my feet a bit. However, once I dove in and committed to the idea, I learned to actually enjoy it. The best thing about Harvest? They have a plugin for Chrome that allows you to hit a little timer each time you start a project. You don’t have to open any windows, just simply remember to press “start.” This process helped me map out my days in advance and really plan where I would spend time focusing on projects versus getting caught up in the mass amounts of emails that flood in on the daily basis. A couple other time tracking tools to review: Toggl and Everhour. Are there any virtual tools that you would like to add to this list? Let me know in the comments below! 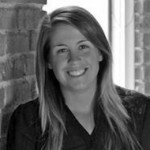 Sara Jantsch is the Director of Community at Duct Tape Marketing. It is Sara’s job to see to all the little things that make our community members feel appreciated, informed, special and looked after. She is also a Marketing Consultant and has a strong passion for working with small business owners. Connect with Sara on Twitter.